Since July-1st.2006 the Qinghai-Tibet railway began operations, for the tourist have one more traffic channel to access Tibet .and by train way travel to Tibet,You will get chance to experience the Qinghai-Tibet railway and enjoy the Qinghai-Tibet highland scenery by the train tour .The following form is the railway operation schedule from china several cities to Tibet ,and from Tibet to china .if you consider by train to travel to Tibet you can reference below form to plan your Tibet tour . For the detail information you can reference following schedule as we have recommend under. Note: the train ticket costs we listed in the table is net ticket cost, but most of the time it is very difficult to get the train tickets as there are huge number of visitors taking the train every day, so certain amount of services will be added to get the tickets from local ticket agent, exact amount of service fees will different based on the season, so please contact our trip advisor for exact cost of the tickets. The new train road running from 2014 Lhasa -Shigatse and Shigatse to Lhasa both citeis ,this is a shortly railway road in Tibet . 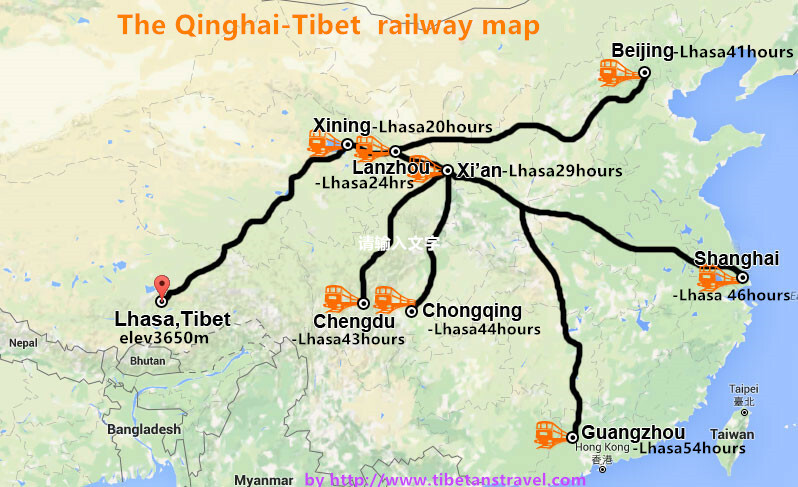 Note:Unless the Beijing_Lhasa No Z21/Z22 train and Xining-Lhasa N9801/N9802 train have operate every day between both of cities, Other train will departure the next day .Accordance the Qinghai-Tibet railway office regular ,if the passenger need purchase the Qinghai-Tibet railway train ticket from China to Tibet or departure from Tibet to China must booking before 20days prior to your departure, otherwise you cannot purchase the train ticket to into Tibet or depart from Tibet to China by train. If you booking the Tibet tour with our Tibetanstravel tour operator team .we will help you booking the train ticket from these cities to Tibet .and from Tibet to china these cities. 1. What documents are needed to board a train to Tibet? If you are taking the train to Tibet from China , you will only need a copy of theTibet tour permit we will send a copy of the permit by email that you can print out and take with you on the train. 2. What types of seats are available on the train? There are three main types of seats on the train: hard seat, hard sleeper and soft sleeper. Hard seat is just a metal seat where all passengers sit next to each other in open compartments of 4 or 6. Westerners rarely choose this option, especially for long train rides. In hard sleepers there are 6 berths to a cabin and you will have your own bed. There is enough space to lie down but not sit up on your bunk. Soft sleeper is the most comfortable and expensive option on the train. They are usually expensive than hard sleepers. There are 4 berths in each cabin and is equipped with its own TV. Toilets on the train are shared and are located at the end of each carriage. 3. Can I book the train tickets myself? 4. Why do I have to pay a few hundred more than actual to get a train ticket? Train tickets to Tibet are in very high demand and are nearly impossible to acquire in the regular way. First off, there are limited trains to Tibet and most of the seats are under state control, especially in soft sleeper. There are only 48 soft berths in each train and the government occupies most of them when they are needed. Secondly, there are numerous ticket-dealing agents that sell the tickets for a higher cost; so during high season, all tickets come with a very expensive service fee. 5. What are the risks if I try to book my own train tickets during the high season? We should always book train tickets from the ticket dealers in advance. If you would like to book your own ticket, then we won’t book your ticket for you and you will have to get in line at the train ticket counter to purchase them. It is very common that all the train tickets are sold out before they even begin to be sold from the ticket counter. In this care, we will try to purchase the tickets for you but because of the late booking, there might be an expensive surcharge. 6. How far is the Lhasa Train Station from the city? The Lhasa Train Station is only 15km southwest of Lhasa. It is separated from the main city by Lhasa River. It should only take around 25 minutes to get to the center of the Lhasa city. 7. How do I receive the train tickets if I booked them with you? if you book the train tickets with us along with the packaged tour, then we will arrange for the train tickets to be delivered to your hotel in China. You will need to send us the address of your hotel and your booking number. Usually we will make the delivery 7 days prior to departure. 8. When should I arrive at the train station? For the most part, trains depart on time and you are advised to arrive at the train station 2 hours before your departure time. You will need to fill out a health record form prior to departing and there are often many people in line so it may take some time to check into the train. 9. Are meals served on the train?